I volunteered to make cookies for a Cookies for Kids Cancer bake sale at our elementary school. Meems has two friends who have been battling neuroblastoma since they were little. What am I saying, little, what I mean is littler. We're talking elementary school here. Seriously, what's wrong with me? I feel I am a relatively accomplished person. But wow. Baking cookies is not my forte, clearly. Most of these are overdone. Some are overdone on the edges, yet raw in the middle. Some are broken, my thumb went through one of them and none of them look very appetizing. I have to package these bad boys up and offer them up for sale. Yum, right? This is what my children will remember about their childhood. This is what my cookies usually look like. The over achiever in me says start over. The realist in me says you're out of sugar and the roads are icy and this took FOREVER and do you really think you can do better than this? I mean, really? The realist in me knows me too well. I will package up a few of the prettier ones and call it a day and hope that no one is keeping track of the cookies too closely. I baked, I packaged and now we'll try to keep this as anonymous as possible. Surely there will be a bazillion chocolate chip cookies, right? The rest of these will go in my kids' lunches. Because they actually are super excited about the brown, crunchy ones. 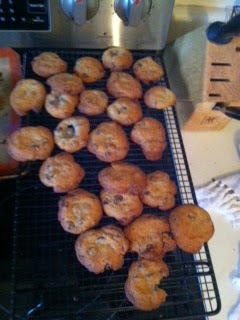 I am a hero for baking enough cookies for them to have some too! Which makes me happy and sad all at once. Poor Little Meems won't even know to be embarrassed about turning these in because she thinks that's how cookies are supposed to look.